Located just outside of Bracebridge Ontario, Brooklands Farm is a barn and property wedding venue that is dedicated to wonderful customer service. The moment you drive onto the property off butter and egg road you will be greeted with a joyful and loving host dedicated to making her property to be the best wedding host location in Muskoka. We have photographed many weddings at Brooklands Farm, some in the fall with the beautiful fall colours, some in the summer with the warmth of the sun beating down on the day. 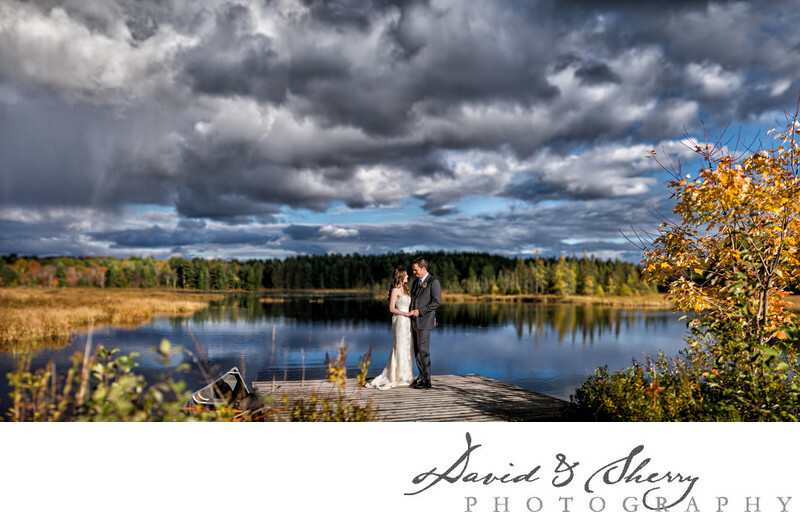 This particular photo is taken on the dock in the fall with the yellow trees in the background and the blue lake and sky contrasting against the colours with the bride and groom on the dock holding hands gazing into each others' eyes. The photographic technique we used was called the Brenizer effect where we took the picture with an 85mm f/1.4 lens and took many photos to create a panorama then we stitched them together in photoshop in order to get the depth of field and compression of the 85mm f/1.4 with the width of a wide angle 24mm lens. I love the effect this gives to the picture and is one of many techniques we use to create stunning wedding photos for our clients at Brooklands Farm.